Sometimes the most trivial things can make the biggest impression. 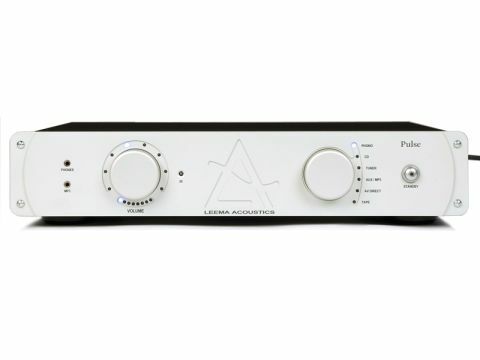 We were greatly taken with the power button on the Leema Pulse amplifier. It does the same as most – brings it out of standby – but it has just the right combination of travel, spring force and general feel and shows how a little thought can add to general pride of ownership in unexpected ways. There's a lot more to like about the Pulse amp, of course. The rest of the front panel, for starters, is a large brushed aluminium affair with a deeply engraved logo and lots of blue LEDs that indicate volume setting and selected input. The knobs for both those functions are also made from solid aluminium and rotate nicely and without wobble or eccentricity. Leema has chosen an unusual way to illustrate volume setting, with eight well-spaced LEDs around the volume control from eight to four o'clock, and eight closely-spaced ones below. The former show large steps and the latter small ones of 1dB (actual volume steps are 0.5dB). We'd have lit the small-step LEDs in the opposite direction, but anyway it's a neat solution for easy repeatability. We almost felt nostalgic when we opened this amp up and found not a single surfacemount component on the audio board. With its electronic volume control and recent vintage output transistors it's certainly not a throwback, however, and has clearly been painstakingly designed with a small number of high performance op-amps and a selection of small-signal transistors in addition to the output power devices. Input selection uses relays. Output transistors are mounted on a single large heatsink with a simple over-temperature protection device, and power is sourced from a large toroidal transformer. In addition to five line inputs there are both flavours of phono, while multi-component integration is provided by Leema's proprietary LIPS – 'Leema Intelligent Protocol System'. Although this amp didn't quite elicit such a chorus of praise as the Electrocompaniet PI-2, it still shed light on recordings in ways that no other amps quite did, suggesting that it certainly has its own unique strengths. Among Hi-Fi specifics, it was greatly liked for its bass, which was variously described as deep, detailed and well defined. Among other characteristics, this seems to be a very honest amp that does little to conceal the limitations of imperfect recordings. We always make a point of including at least a couple of those in the listening session since so few recordings in the real world come truly up to scratch. For example, the Penguin Café Orchestra track is good in many ways, but lacks a little detail in the midrange and that was picked up on with this amp. Led Zeppelin sounded a little brash, while with the operatic track, our listeners duly picked up on some excellent detail in the lower strings of the orchestra, as well as a very well-scaled crescendo to a powerful climax. It seems, indeed, that Leema has struck a pretty good balance between warts-and-all and general musical life and energy with this amp. The main warning note we would sound is about voices, which sometimes seem just a shade dry and less clear than we'd expect, but otherwise this is an amp with a fine combination analysis and just enough character to keep things interesting. The phono stage, not part of the blind test, is very fine with moving magnet cartridges, just a little constricted with moving coils.